What to do with an abundance of basil in the house? Make pesto! Nigel made the pesto while I scoured my pinterest account for previously pinned pesto recipes. 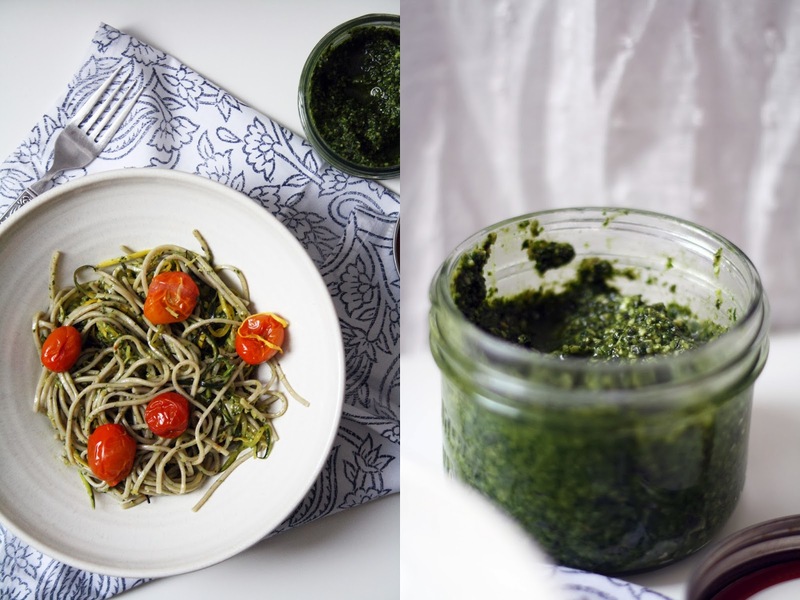 We had some leftover naan and made this deliciously flavoured, highly recommended, open face naan'which one night, we brunched on a potato egg skillet, adding some pesto for good measure, and finished off the pesto jar with this warm bowl of soba noodles. Combine all of the ingredients, minus the olive oil, into a food processor. Pulse a few times to combine. Slowly add the olive oil and continue to pulse until desired texture has been achieved. It happens quick. Store in an air tight container in the fridge. It will keep for a few weeks. note: no worries if you don't have a julienne peeler, a carrot peeler would work just as well - producing ribbons as opposed to 'shreds.' on a side note, julienne peelers are awesome and super affordable - changed my life in the kitchen. In a medium size bowl, combine the zucchini and baby tomatoes. Drizzle with olive oil, salt and pepper. Transfer to a parchment lined baking pan and roast for roughly 30 minutes, until the tomatoes start to blister. While the veggies are roasting, bring a pot of water to boil and cook the soba noodles according to the package. To assemble, mix the warm noodles, zucchinis and pesto in a large bowl. Use as much pesto as you'd like. Serve onto four plates and top with the roasted tomatoes and a dose of fresh cracked pepper.